The waters surrounding Chuuk’s tiny Shark Island are home to several species of sharks, including the gray, blacktip, and whitetip reef sharks. The island, which is no bigger than a baseball diamond and supports a handful of coconut trees, is circled by dozens of sharks. Shark Island is known as a “cleaning station” where hungry cleaner wrasses rid sharks of dead skin, external parasites, and other pests. The waters surrounding tiny Shark Island in Chuuk are known as a 'cleaning station' for sharks. They travel here to rid themselves of dead skin and parasites. Hall: Well, can you think of a better name? I certainly can’t. The cleaning station is a magnet for sharks. You can see up to 25 here sometimes. Hall: You can see them on nearly every dive. Beyond the wrecks, there’s a good chance you’ll see a gray reef shark. A lot of times the divers are so interested in the wrecks that they won’t see the sharks swimming right over them. 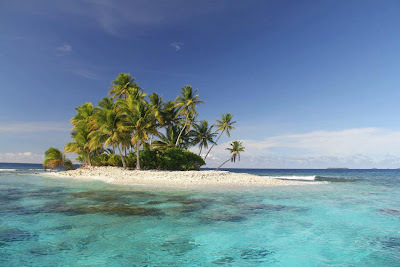 swim around Shark Island in Chuuk. Hall: We don’t see that many whitetip reefs, but we do see a lot of grays and blacktips. On the outreef, we’ll see silvertips and the occasional silky, down to about 30 meters depth. I once saw a tiger shark inside the lagoon. Hall: It is so important. The tourism industry is the only real industry we have here in Chuuk. One diver can bring in several thousand dollars per trip. They pay the diver fees, including the government’s $30 user fee, but they also stay in hotels, rent cars, and eat in our restaurants. Living sharks are worth far more than dead ones. Shark diving is a sustainable business, whereas commercial shark fishing is not. We can bring divers out to Shark Island every day, but a fisherman would only be able to fish it once and the sharks would be gone. Hall: I’m always surprised how many divers have never seen a shark, and I’m happy to give them the opportunity to go see them. And even for those who have seen sharks, most have never seen a cleaning station like Shark Island. 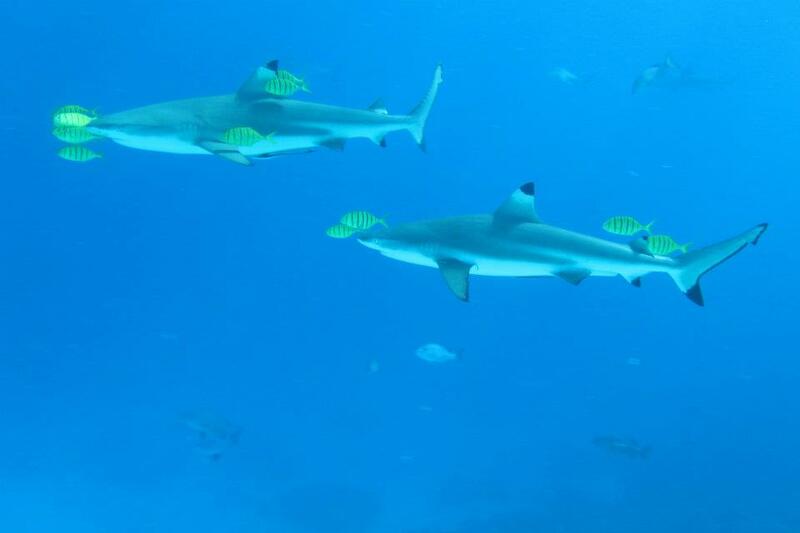 During the Micronesian Chief Executives’ Summit in July 2011, representatives from Chuuk and other regions pledged to join a much larger effort to create the Micronesia Regional Shark Sanctuary. The agreement includes all four members of the Federated States of Micronesia—Yap, Chuuk, Pohnpei, and Kosrae—as well as the Northern Mariana Islands, Guam, Palau, and the Marshall Islands. Once established, it will result in a regional sanctuary covering 5 million square kilometers (2 million square miles). For more than a year, the Pew Environment Group has been working with communities in FSM discuss the important role sharks play in their waters. On Sept. 21, 2012, Kosrae became the first state of Micronesia to make the commitment to protect sharks in its waters. The unanimous vote by the legislature in Kosrae, a small island of 7,700 people in the Pacific, is an important step toward creation of the regional shark sanctuary. The legislation now heads to Gov. Lyndon Jackson’s desk for signature. For more information about the Pew Environment Group’s global shark conservation work, visit www.PewEnvironment.org/sharks. Diving in safer waters is enough of a rush. However, from what I hear, this kind takes diving to whole other level of excitement.It almost makes me want to try it myself. I hope that they continue to be shark sanctuaries. 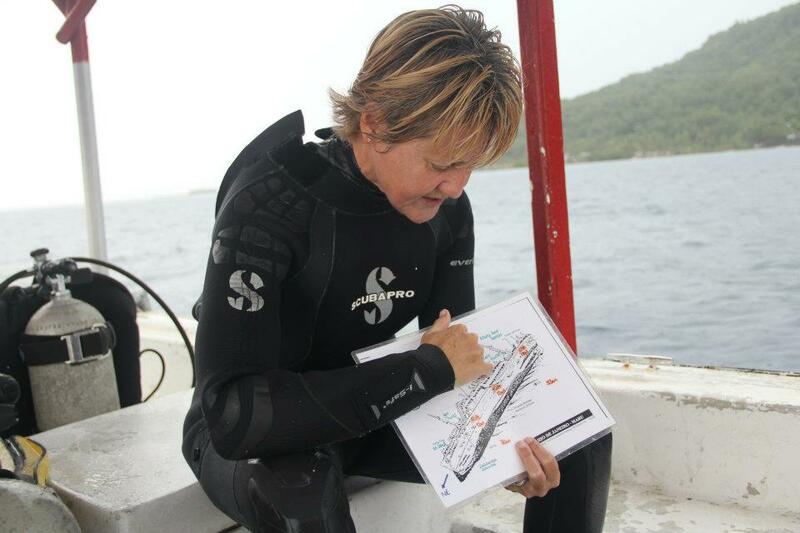 I am still advocating better reef patrol to catch and stop poachers.